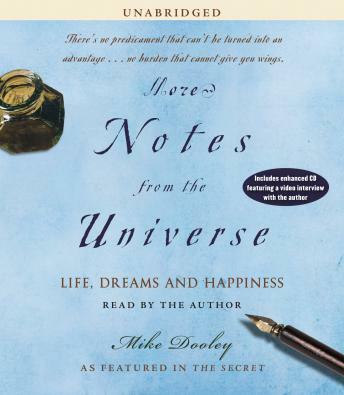 The Universe returns in this second volume of Notes from the Universe, overflowing with even more valuable reminders of the absolute power you have over your life. The powerful affirmations penned and read by author Mike Dooley will have you once again thinking positively, feeling confident, and walking the path to personal fulfillment, drawing you ever closer to the life you always dreamed you would live. There is more to living in the jungles of time and space than meets the eye. Just behind the 'curtains,' in the unseen, there is a love and an essence that yearns for us to have all that we want. There, the Universe literally conspires on our behalf, aligning players and circumstances in unimaginable ways, drawing to each of us that which we most focus upon and move with. Any wish can be granted and every challenge can be surmounted when we remember how life really works and who we really are. In More Notes from the Universe, Mike Dooley once again acts as a liaison for the Universe, serving up such reminders to help keep listeners feeling grounded, excited, and, at times, laughing, all the way to enlightenment.